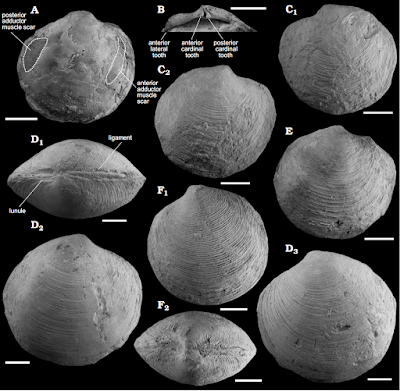 Sciency Thoughts: Meganodontia haunuiensis, Elliptiolucina neozelandica, and Lucinoma saetheri: Three new species of Lucinid Bivalves from Miocene hydrocarbon seeps on eastern North Island, New Zealand. 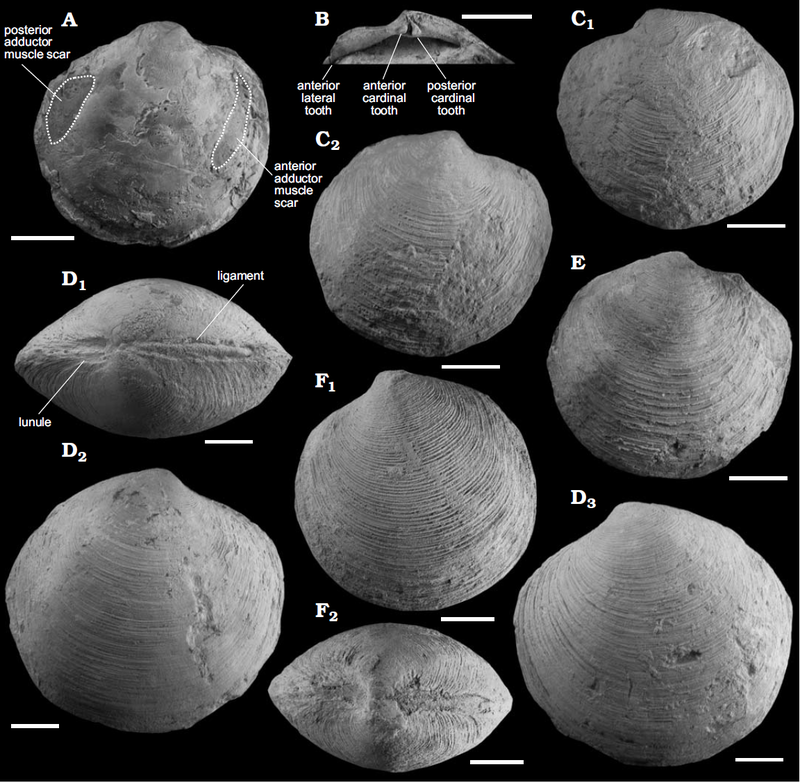 Meganodontia haunuiensis, Elliptiolucina neozelandica, and Lucinoma saetheri: Three new species of Lucinid Bivalves from Miocene hydrocarbon seeps on eastern North Island, New Zealand. Ludinid Bivalces, Lucinidae, are large marine Bivalves which lack syphons, but which have an elongate foot with a long chanel that serves the same purpose. All modern Lucinids host colonies of symbiotic sulfur-oxidizing Bacteria in their gills, which enable them to colonise and thrive in sulphur-rich subtidal sediments. The first Lucinids appeared in the Silurian, though they remained a minor constituent of Bivalve faunas until the Late Cretaceous, when they underwent a major radiation at roughly the same time as Mangroves and Seagrass meadows appeared, which may have been when they acquired their symbiont Bacteria. 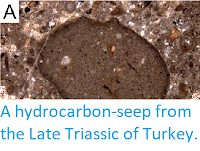 Lucinids also form a significant part of the communities that live around hydrocarbon seeps (areas where hydrocarbons escape into the sea from exposed deposits). 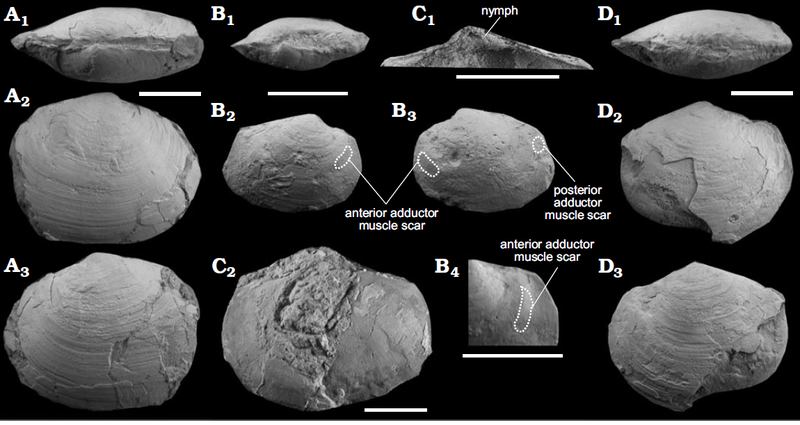 In a paper published in the journal Acta Palaeontologica Polonica on 28 March 2018, Kazutaka Amano of the Department of Geoscience at Joetsu University of Education, Crispin Little of the School of Earth and Environment at the University of Leeds, and Kathleen Campbell of the School of Environment at the University of Auckland, describe three new species of Lucinid Bivalves from Early and Middle Miocene hydrocarbon seeps from the area around Hawke Bay on eastern North Island, New Zealand. Lucinid Bivalve Meganodontia haunuiensis from the lower Miocene Ihungia Limestone at Haunui and Ugly Hill, North Island, New Zealand. (A) Specimen UOA L4777, edentulous hinge plate of left valve (A₁,), left valve (A₂). (B) Specimen UOA L4581, dorsal view (B₁) and frontal view (B₂) of right valve. (C) Specimen UOA L4791, edentulous hinge plate of right valve. (D) Specimen UOA L4790, right valve of small specimen. (E) Specimen UOA L4782, dorsal view of slightly compressed specimen (E₁), left valve (E₂). (F) Specimen UOA L4792, dorsal view showing symmetric lunule in both valves (F₁), right valve showing internal mould (F₂), enlargement of the anterior adductor muscle scar of F₂ (F₃). (G) Specimen UOA L 4789, right valve, showing internal mould of small specimen. Scale bars 10 mm. Amano et al. (2018). 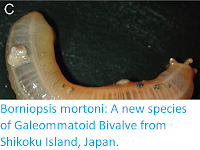 The second new species is placed in the genus Elliptiolucina, which currently contains five living species from the Indo-Pacific region, and given the specific name neozelandica, meaning New Zealand. 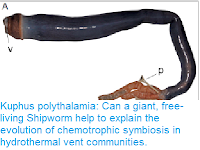 This is a small species, with described specimens ranging from 17.1 to 34.9 mm in length, with a thin, flattened shell. 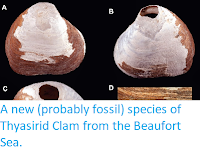 It was found in the Middle Miocene Bexhaven Limestone at the Moonlight North seep sight, to the north of Hawke Bay. Lucinid Bivalve Elliptiolucina neozelandica from the Middle Miocene Bexhaven Limestone at Moonlight North, North Island, New Zealand. (A) Specimen UOA L4771, dorsal view (A₁), right (A₂) and left (A₃) valves. 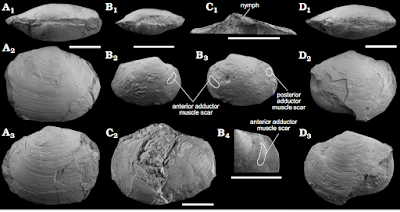 (B) Specimen UOA L4783, dorsal view (B₁), right valve (B₂), internal mould of left valve (B₂), enlargement of anterior adductor muscle scar in B₂ (B₄). (C). Specimen UOA L4775, edentulous hinge plate of right valve (C₁), left valve (C₂). (D) Specimen UOA L4774, dorsal view (D₁), right (D₂) and left (D₃) valves. Scale bars 10 mm. Amano et al. (2018). 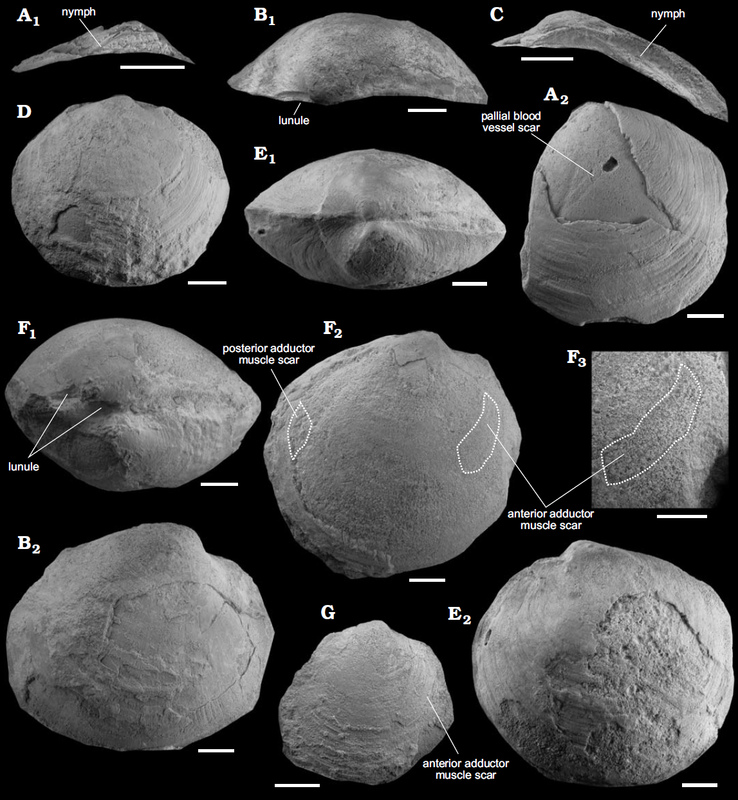 The third new species described is placed in the genus Lucinoma, whuch has 38 described living species as well as two previously described Miocene ones, from Italy and New Zealand, and is given the specific name saetheri, in honour of Kristian Saether of the University of Auckland, for his work on the hydrocarbon seep fauna of New Zealand. This is a large species, with measured specimens ranging from 39.6 to 67.4 mm in length, with a thick, subcircular shell, with is moderately inflated with week ribs and a straight antero-dorsal margin. 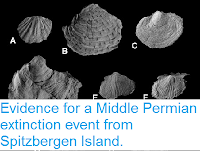 The species was found in the Early Miocene Ihungia Limestone to the south of Hawke Bay, and the Middle Miocene Bexhaven Limestone at the Moonlight North seep sight, to the north. Lucinid Bivalve Lucinoma saetheri from the lower Miocene Ihungia Limestone at Ugly Hill and the middle Miocene Bexhaven Limestone at Moonlight North, North Island, New Zealand. (A) Specimen UOA L4773, internal mould of right valve. (B) Specimen UOA L 4772, hinge plate of right valve. (C) Specimen UOA L4785, left (C₁) and right (C₂) valves. (D) Specimen UOA L4780, dorsal view (D₁), right (D₂) and left (D₃) valves. (E) Specimen UOA L4786, right valve. (F) Specimen UOA L 4779, left valve showing lamellated commarginal riblets (F₁), dorsal view (F₂). Scale bars 10 mm. Amano et al. (2018).